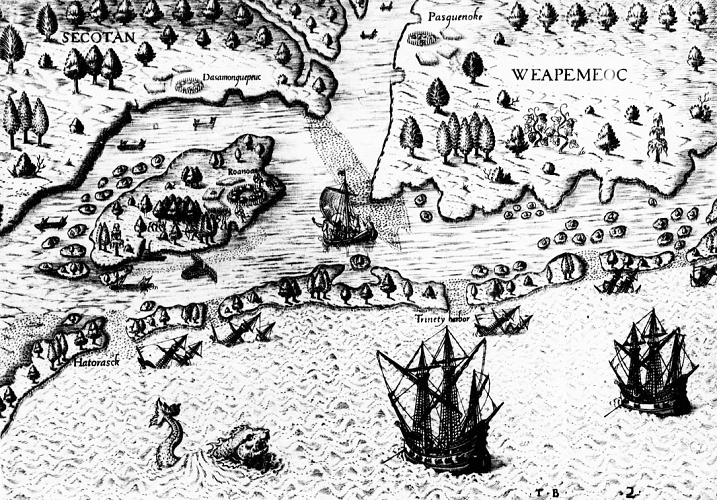 The Amadas and Barlowe Expedition was the first of the English voyages to Roanoke Island in the 1580s and was one of Sir Walter Raleigh's attempts to establish a colony in the New World. The expedition, led by Capt. Philip Amadas and Master Arthur Barlowe, left England with two ships piloted by veteran Portuguese navigator Simon Fernándes on 27 Apr. 1584. Amadas, who commanded the flagship (which may have been Raleigh's 200-ton vessel Bark Raleigh), was a member of Raleigh's official household, where he may have studied instrumental navigation and related mathematics under Thomas Harriot. Barlowe, commander of the other vessel (possibly a smaller sailboat named the Dorothy), had become one of Raleigh's "owne servants" in Ireland as early as 1580-81. After sailing through the Canary Islands and the Caribbean, the two ships reached the mainland American coast on 4 July 1584. They sailed northward until they reached an "entrance, or River issuing into the Sea." According to a later account by one Richard Butler, they landed first near present-day Ocracoke Island, though Barlowe's journal suggests an initial landing farther north, nearer present-day Oregon Inlet. The exact location is difficult to determine because of centuries of change in the barrier islands. After anchoring, the explorers went ashore in boats to view and take possession of the "lande next adjoyning" for Queen Elizabeth I and their patron, Raleigh. Barlowe's journal provides an almost lyrical description of the land and its exploration. In addition to extolling the natural bounty and beauty of the coastal region (perhaps too favorably), Barlowe sympathetically portrayed the Algonquian Indians whom the Englishmen soon encountered and with whom they almost immediately began to trade. Barlowe also tried to give a rough idea of the geography of the region as best he and his companions could understand it from the Indians, who called the area "Wingandacoa." He recounted a visit to the town of Roanoke, whose name the island would carry for over four centuries. After perhaps as long as six weeks exploring and trading, the expedition returned to England, taking with it two local Indians: the Croatoan Manteo and the Roanoke Wanchese. The wide-ranging information acquired by Amadas and Barlowe, as well as what they learned from their association with Manteo and Wanchese, gave Raleigh and his associates sufficient encouragement to continue their plans to establish the first English colony in America in 1585. David B. Quinn, The Roanoke Voyages, 1584-1590 (2 vols., 1955). Quinn, Set Fair for Roanoke: Voyages and Colonies, 1584-1606 (1985). "Amadas and Barlowe explore the Outer Banks." Prehistory, contact, and the Lost Colony. LearnNC.org. http://www.learnnc.org/lp/editions/nchist-twoworlds/1846 (accessed June 25, 2012). Barlowe, Arthur. "Captain Arthur Barlowe's Narrative of the First Voyage to the Coasts of America" in Burrage, Henry S. (editor). Early English and French Voyages, Chiefly from Hakluyt, 1534-1608. New York: Charles Scribner's Sons, 1906. Pages 225-241. online facsimile edition at http://www.americanjourneys.org/aj-034/ (accessed June 25, 2012). Houston, Lebame and Dough, Wynne. "Amadas and Barlowe" National Park Service. http://www.nps.gov/fora/forteachers/amadas-and-barlowe.htm (accessed June 25, 2012).